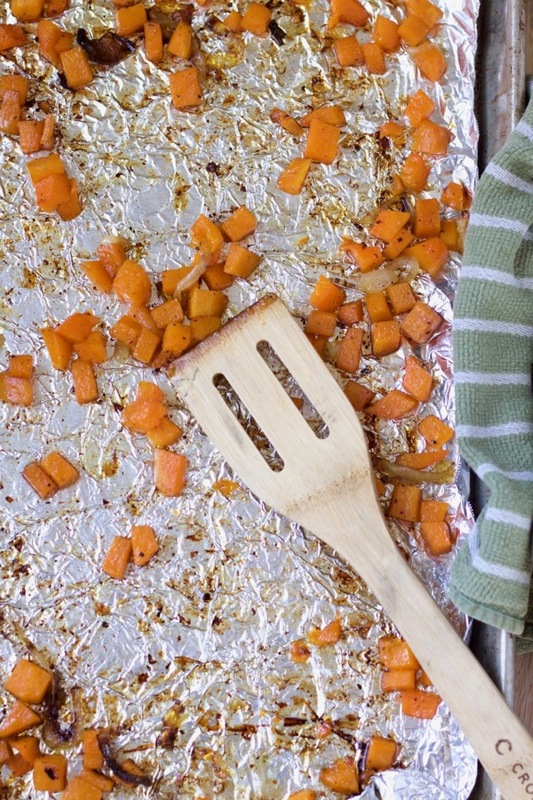 Roasted Butternut Squash with Onions. If Life-Changing Super Crispy Roasted Potatoes didn’t convert you to the process of cooking bacon in the oven and then making delicious roast-y veggies in the bacon grease left on the pan, perhaps I can interest you in this roasted butternut squash with onions situation? GOSH, it’s good. You’ll cook a package of bacon on a foil-lined pan. When it’s done, remove the bacon and you’ll have a pan of bacon grease that’s just waiting to extend your bacon joy! 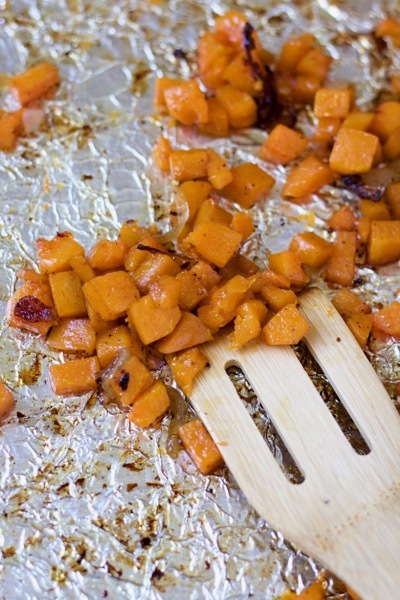 Add a thinly sliced onion and a sprinkle of salt and roast for 10 minutes while you cube up the butternut squash. Add the squash and more salt and roast 20 minutes more, until the squash is tender and the onions are getting caramelized. It’s intensely flavorful – the onions and the squash are both so sweet, and the bacon grease gives it a smoky depth. Lots of salt balances everything out! 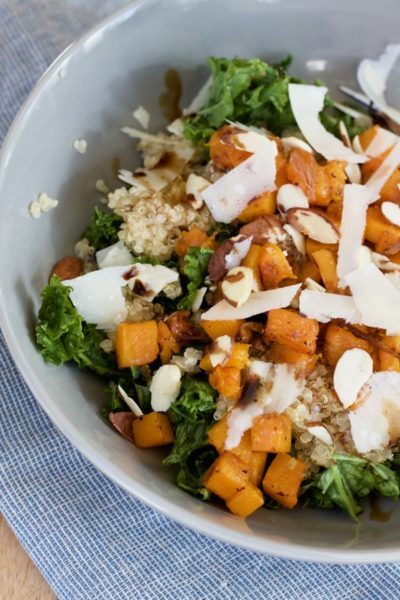 You could certainly eat this as a side dish as-is, but we love it in a bowl with kale + quinoa + parmesan + toasted almonds + balsamic drizzle. Want a fried egg on there? YES YOU DO. I can see adding the roasted butternut squash with onions to a burrito…with brown rice and black beans and lots of melted cheese. Or putting it on a pizza…or stirring it into risotto!! I’ll be making this all fall and winter and will report back if I find a new favorite application (or if I roast something else in bacon grease. Because I’ve got my eye on Brussels sprouts next.) Let me know your ideas in the comments! Preheat the oven to 425. Toss the sliced onions with the bacon grease on the foil-lined sheet pan and sprinkle with kosher salt. Roast for 10 minutes (you can be peeling and dicing the squash during this time). Add the cubed butternut squash and more salt and pepper and stir, then roast for 20 minutes more until the squash is tender and the onions are getting caramelized. add to a burrito or on top of a pizza! If your bacon cooked out a ton of fat, you may want to remove some of the grease from the foil and either discard it or save it for another use before roasting. That said, a generous amount of bacon fat helps add a ton of flavor! I think a sprinkle of cayenne or chili powder would be awesome on this if you like a little heat. Tender Roasted Potatoes and Butternut Squash (with melty cheddar).